Editor’s note: President Barack Obama unveiled a series of measures Tuesday to cut gun violence. Chief among them, tighter rules and more enforcement on background checks of gun buyers. The president referred to these as “actions,” not “orders.” What’s the difference? Read our story here to find out. ORIGINAL POST FROM June 18, 2014 | Republicans this midterm season are claiming that President Barack Obama is an “imperial” president (while at the same time saying he’s feckless and weak, as the New York Times pointed out last month). One of the areas that has really rankled Republicans has been the president’s ramped up use of executive actions. Just this week, the president took unilateral domestic actions on LGBT rights and manufacturing. That’s in addition to his earlier controversial move imposing virtual carbon caps on states as well as acting on student loans. Some House Republicans want to sue for what they see as overreach on executive actions. Earlier this year, they even introduced the Stop This Overreaching Presidency Resolution, or STOP. But what do the numbers tell us? Has Mr. Obama really abused executive action? It turns out he actually ranks pretty far down the list on total number of orders issued. His 181 (soon to be 183 when he signs the LGBT and the manufacturing actions) ranks him just 19th of the 44 presidents — behind all of his modern predecessors except George H.W. Bush, who only served one term. George W. Bush (291), Bill Clinton (364), Ronald Reagan (381) and even Jimmy Carter (320), who served just four years, all issued more orders. Four American presidents issued more than 1,000 executive orders. Franklin Delano Roosevelt used executive actions the most with 3,522 in his three terms — 19 times what Obama has done. Check out NewsHour’s executive action interactive, based on data from The American Presidency Project at the University of California-Santa Barbara and the National Archives. Editor’s note: This text was excerpted from The Morning Line. 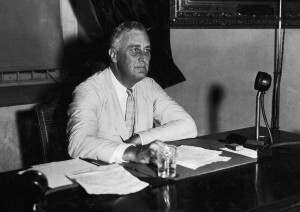 Left: Franklin D. Roosevelt issued 3,721 executive orders in his 12 years in office.